It is vital to maintain the outside of your house in a good condition. All the money and time you spend on inside decorations will soon be wasted if damp starts to penetrate, or – worse still! – the fabric of the building starts to rot and/or crumble. It is unlikely that you will want to carry out all of the maintcnancejobs and repairs listed below yourself. Nevertheless, it is important to be able to spot trouble areas, and to have sufficient knowledge intelligently to discuss possible remedies with a builder. Do not wait for exterior faults to make their presence known internally. Regularly check the exterior of your property so that you can put defects right before they become serious problems. Building faults never go away of their own accord. They may seem to disappear in fine weather. But they always return, and ultimately get worse. If you tackle the various parts of your house systematically, using the notes below as a check list, an exterior inspection will not seem such an impossible and alien task. Start with an inspection of the roof, because it is essential that this is kept in a good state of repair. It is inadvisable for an amateur to tackle roof repairs, especially when these involve working at a considerable height, unless he or she feels absolutely confident about the task in hand. Nevertheless, you will need a knowledge of roof faults and roof ‘language’ when talking to your builder. Pitched roofs built before the second world war are usually covered with slates or clay tiles. Modern roofs usually have concrete tiles. Check regularly for cracked, slipped or missing ones. Ideally, you should spot these before water coming through a ceiling makes them obvious and causes additional damage. If you have a pair of binoculars, you can inspect your roof from the ground, front and back. Working at a height is only recommended for those who feel completely sure of themselves. Do not attempt to climb ladders unless fully confident; ladder accidents are tragically common amongst professionals and amateurs alike. Before each time of use, check ladders and steps carefully for rotten or missing parts, loose joints and screws etc. Make sure that steps are fully opened and standing steady before use. Where possible, place them on firm, non-slip level ground. If the ground is uneven, place a small wooden block under one leg. If the ground is very soft, stand the ladder on a board, with a wooden strip screwed across to make a stop ledge. Alternatively, ladder bases can be anchored by lashing to pegs, or can be wedged with a sandbag. An extension ladder must have at least a three rung overlap between sections; and at least three rungs of the ladder should extend above the height of whatever you are working at. Positioning a tall ladder is easier with a helper, who can hold one end firm while you lift up the other end, and position it vertically against the house wall. Then you can pull out the bottom to the correct angle: ‘one out for every four up’, so that the distance between the bottom of the ladder and the house wall is one quarter of the ladder’s height. Tie the top of the ladder to a large screw eye fixed into the gutter fascia. Do not rest the top of the ladder against glass, slates or plastic guttering. Do not reach out sideways from a ladder. Do not lean backwards, but if necessary fit ladder stays to hold the ladder out from the wall. Make sure that you are wearing well-fitting, dry shoes. chinks of light where tiles are cracked, have slipped or are missing. If your roof has a felt-lining below the tiles, look for water stains as a sign of leaks. Better still, visit your loft when it is actually raining and see for yourself where the water is coming in… a depressing experience! Bear in mind that water often starts dripping some distance from the actual leak, because it tends to run down inside the roof first. As a temporary measure, place a large bucket or basin in the loft – rest this on boards supported across the joists — to catch the drips and stop them coming through the ceiling. Then consult your builder. Flat roofs are usually covered with layers of bituminous felt or with asphalt which is spread while hot. Small areas of damaged roofing felt can sometimes be repaired with bituminous mastic but if the felt is badly cracked and brittle, arrange for all of it to be replaced. 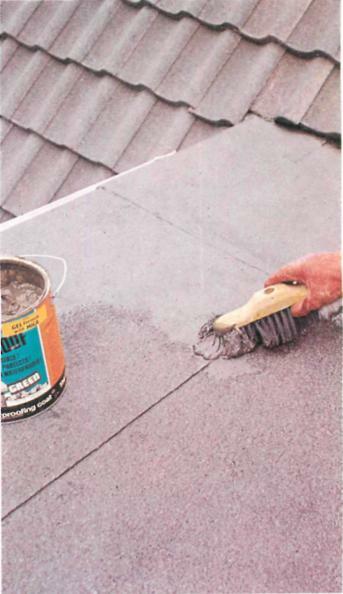 Never use a flat roof as a sunroof or as a balcony without first checking with a surveyor or builder that the roof can take the extra weight; its surface will then need 150 protecting with tiles, which are usually made of asbestos and set into bitumen. Flashings or ‘sealing strips’ are an important part of a sound roof, because they waterproof the gaps where two angles of the roof meet or where the roof meets with another part of the house, such as the chimney stack. Flashings can be made from a wide variety of materials, including strips of mortar, felt, lead, zinc, or an asbestos bitumen compound. Torn, cracked or missing flashings will allow damp into the house, so it is essential to keep them in good repair. You may be able to carry out small repairs with special waterproof tapes sold for this purpose at builders’ merchants. Alternatively you can use several coats of a proprietary bituminous compound. However, flashings which have badly deteriorated must be replaced completely: consult your builder. Chimneys should not be ignored merely because they are so far away and inaccessible! At best they may be porous and allow in damp; have them sealed with a coat of silicone water repellent. Or there may be minor cracks which need filling with mastic. Or the pointing between the bricks may be crumbling; in which case it will need raking out and replacing. At worst, the brickwork of the chimney itself may be crumbling, in which case the chimney must be re-built, as this could be extremely dangerous. Your chimney pots may be set into concrete at the top of the chimney stack; this is called ‘flaunching’, and should be kept in a good state of repair, with no cracks or crumbling areas that may let in the damp. Also, fit wire netting over the top of the chimneys to stop birds from nesting in them. Chimneys which are not in use can be sealed off but it is important that the flue remains ventilated. You can use a half-round tile or a special capping pot to seal the chimney; these allow ventilation but keep out the rain. Inside the house, where fireplaces are sealed off, fit an airbrick or ventilator into the chimney-breast to stop damp being caused by condensation inside the flue. Left: brush-on bituminous mastic will seal small areas of damaged roofing felt Right: clean out all gutters at least once a year – but first read carefully our points on ladder safety. Guttering and downpipes are sometimes called ‘rainwater goods’. Gutters run around the bottom edge of your roof, to collect the rainwater, and prevent it from spilling over on to roofs and walls to cause damp or even rot. Modern gutters are commonly made of plastic, but older ones may be cast iron. Plastic gutters need little maintenance, but cast-iron gutters need painting inside and out from time to time. First remove any rusty patches with a wire brush, and then prime with a metal primer and allow to dry before applying paint. In general you should use oil-based gloss paint – you can use up left-overs from other jobs on the insides of the gutters, since they will not be seen from the ground. But if the gutters have been painted previously with bituminous paint, you will have to use this kind of paint again, because bitumen ‘bleeds through’ of any subsequent gloss coating. If you are not sure whether bituminous paint was used before, do a small test area to find out. Apply a little square of white gloss, allow to dry and see if any colour works its way through to the surface after a day or two. Periodically check the slope of your gutters too, to make sure they are carrying the water to the downpipes. Check for cracks and sagging, and also for cracked joints between sections. You may be able to make small repairs with waterproof tape or to repair damaged sections with a glass-fibre kit from your builders’ merchant. However, it may be necessary completely to replace a damaged section. Blocked gutters are a common cause of damp patches on adjacent walls. At least ‘5’ twice a year , check that your gutters are clear of leaves, twigs and other debris. As much debris as possible should be scooped out and removed. Then the gutters can be flushed through with clean water from a hosepipe. But place a small basin at the bottom of the drainpipes to stop twigs etc. from entering the drains where they might eventually form a blockage. When your gutters are clean and running freely, protect them from further blockage with wire mesh sold specially for the purpose. Gutters are attached to wooden ‘fascia boards’ which run around the bottom edge of the roof. Check these at the same time as you check your gutters, and repaint them from time to time to prevent rot. Any rotten sections must be replaced, and the brackets that hold the gutters should be checked for firm fixings. Downpipes carry the water from the gutters to the drains and it is just as vital to keep them in good repair. A leaking downpipe is not necessarily as obvious as a leaking gutter, but over a period of time can cause considerable damage to the fabric of the building. Watch out for telltale damp patches or green mouldy areas around downpipes and do not ignore them; they are the symptoms of a prime cause of dry rot. You can hire a set of drain rods to clear a blockage in your outside drains. Here, the blockage is between the two inspection chambers. Different attachments will cope with various types of blockage. Always turn the rods clockwise: if yon turn them the other way, the sections will unscrew and you will be worse off than before. Repair downpipes in the same manner as for gutters. Downpipes are fixed to wooden plugs inserted into the brickwork of the house; if these have started to work loose, replace them with larger plugs. Birds often nest in the tops of down-pipes. If this happens, carefully lift out the nest with a piece of hooked wire. Don’t try to wash the nest away with water because it may simply get stuck farther down the pipe. You may be able to clear other minor obstructions in downpipes with a long cane with a piece of rag tied to its end to make a pad. If your downpipe becomes badly blocked, you can tell where the pipe is obstructed because just above the blockage, water will be flowing out of thejoint between sections of the pipe. The down-pipe will have to be taken to pieces section by section as far as the blockage. Open gullies at ground level collect the water from the downpipes. Check that downpipes do indeed empty into a gulley and not on to the ground or against a wall. If necessary, correct the positioning, or lengthen the downpipes. If water persistently splashes up against the walls, fit downpipes with a curved ‘shoe’ section to divert and lessen flow. From the gully, an underground pipe flows into a brick-lined inspection chamber close to the house, covered by a removable, metal man-hole cover. Gullies may be fitted with their own ‘traps’ – an extra underground bend of pipe, the purpose of which is to stop smells – and even rats! – entering the house from the sewer. Carefully remove any accumulated debris such as leaves and twigs from the tops of gullies; don’t push them down into the drain where they could cause a blockage. When gullies are cleared, flush them through with clean water from a hose pipe. Keep gulley gratings clean by washing with hot water and soda, or place metal gulley gratings in a fire for a few-minutes. You can fit a kerb in brick or cement around the top of a gulley and fit with a removable cover to prevent further blockages. Despite the large areas involved, walls too must be inspected regularly for faults. Porous walls may be allowing rainwater to pass through to cause patches of ‘penetrating damp’ inside the house. This is a common problem with older solid walls. It can even happen with cavity walls when the steel ties that hold the two sections of the wall together become bridged by, for example, droppings of mortar. Coat porous walls with a clear silicone water repellent, available from a builders’ merchant. Apply on a dry day, after carefully reading the directions on the can. This treatment will also protect your brickwork from frost. 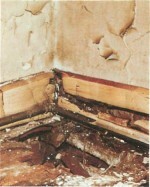 Rising damp is another common problem for walls. Most houses built after the 1870s have a ‘damp-proof course’ or d.p.c. This is a line of waterproof material a few bricks up from the bottom of your outside walls. It can be made of slate or bituminous felt, or an extra thick band of mortar running through the brickwork. Its purpose is to protect the building from rising damp which otherwise might pass up through the brickwork from the soil foundations. If your house does not have a d.p.c., you should have one installed by a specialist. 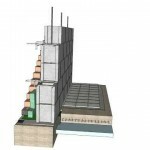 Various methods are used – these include cutting the walls to insert a layer of slate, metal or fibre materials; injecting the walls with damp-repelling liquid; installing hollow tubes of clay to act as airbricks, or fitting a band of copper to get rid of damp by an electrical process known as ‘electro-osmosis’. Get estimates from several firms before making up your mind on the right kind of treatment for your property. Choose a reputable company. Even if your house is provided with a d.p.c., trouble can arise if the d.p.c. 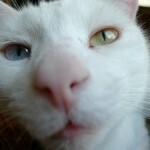 is defective — it must be kept completely clear or it cannot work properly. Dig away any soil that has collected against the walls below the level of the d.p.c. In the same way, you should make sure that any paths are at least 15 cm below the 152 level of d.p.c. Adjoining outbuildings or walls should also have damp-proof courses at the same level as the d.p.c. for the house walls. Any concrete rendering covering the d.p.c. should be hacked away. If, even when cleared, your d.p.c. still appears to be defective, consult a reputable, specialist damp-proofing company. Airbricks provide vital ventilation for suspended floors and prevent dampness from condensation. You will find them set low down in an outside wall looking like an ordinary brick with small round holes or a small grating. Keep your airbricks clear of piled-up soil, leaves and rubbish. Damaged airbricks should be replaced, as they may allow birds or vermin into your property. There are two types of airbrick: for a solid wall, there is an airbrick with holes for the outside of the wall, and a louvre to fix to the inside; a cavity wall airbrick extends right through the wall. Pointing is the mortar holding the bricks together and it may crumble after a period of time. You can attempt small areas of repoint-ing yourself. You will need a small sharp cold chisel and a wooden club hammer for chipping out the old mortar. Also a ‘hawk’ to hold a small amount of mortar while working, and a pointing trowel. Ready-mixed pointing can be bought in small bags— simply add water as directed on the pack. The mix should be neither too stiff, nor too runny – aim for a ‘buttery’ consistency. Chip out the old mortar to a depth of I cm. Brush out all dust, then wet the cavities with water using an old paintbrush. Use your trowel to cut slices of mortar off the hawk and to press the mortar into the cavities. Cover 1 sq. m. at a time, doing the upright joints first, then the horizontal ones. The joints should be finished off to match the. surrounding brickwork. If the bricks are to be painted, then the joints can be left flush. Simply draw the trowel smoothly across the mortar. Hollow or rubbed pointing is shaped when the mortar is partially dry. Use a piece of timber or metal rod about 8 mm in diameter. Draw this along the joints to leave a concave impression. A piece of pipe is easy to use because it can be slightly bent to make it easier to handle. Weathered joints are the trickiest to master. Shape them with the edge of the trowel, cutting away the face of the mortar at the top of the crevice by about 1 cm to prevent rainwater from collect- ing. To make the vertical joints, draw the trowel back towards the right-hand bricks, while keeping a steady pressure inwards with the left-hand side of the trowel. Press inwards with the upper edge of the trowel to shape the horizontal joints. If any mortar drops on to the front of the bricks, leave it to dry before attempting to clean up. When dry, you can lightly scrape it away with a trowel, then finish off by lightly brushing with a wire brush. You may be able simply to turn a brick around to present a fresh undamaged face. Otherwise, you must replace the brick with one that matches if possible; ask your builders’ merchant for a used brick of the same type. Spread pointing around the new brick and slide it into the cavity; then match up the pointing with the rest of the wall. On bricks with only a small amount of damaged surface, it is sometimes possible to make a repair by patching up with mortar, coloured to match the surrounding brickwork. Rendering is a layer of cement applied to external walls and usually painted. It is important to repair cracks and missing patches quickly as water can collect behind the rendering and cause damp inside. Fill small cracks with an exterior grade filler: first undercut the cracks with a scraper so that the crack is wider at the back than at the front, clean out the cavity with a wire brush and then dampen it before applying the filler. Big cracks and holes, and bulging areas must be cut back with a sharp cold chisel and club hammer until sound rendering is reached.. It is not economical to use proprietary fillers for large-scale repairs; use a mortar mix. For repairs of any depth, apply the mortar in layers, giving each layer a chance to dry. Smooth off the final coat with trowel, or with a block of wood. Small hairline cracks on cement rendering can usually be effectively disguised with a proprietary stone or masonry paint which contains mineral particles. Pebbledash is trickier to repair as the aim is to match the surrounding surface. Use a mortar mix to make repairs as described for rendering above, but while this is still wet throw on matching pebbles and if necessary press them in lightly with a piece of board. 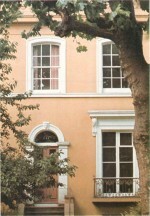 If you cannot get a good match, consider painting the whole of the pebbledash area with a masonry paint. Apply paint with an old worn brush and a sharp dabbing action to ‘punch’ the paint well into the surface of the wall. Wall tiles should be firmly fixed, as loose ones can allow damp to enter. They are usually nailed to battens which in turn are nailed to the wall. Give each tile a sharp tug to make sure that it is secure. If tiles seem loose, this may be caused by corroded nails, or by rotten battens. Tiling must be stripped off until the defective tile is reached. Then this should be re-fixed, replacing the battening if necessary. Then the rest of the tiles must be re-fixed using new nails. Wood cladding should have rotten sections replaced. Old paint should be stripped off: use a scraper and paint stripper if necessary. New coats of paint should consist of at least a primer, an undercoat and two coats of oil-based gloss paint. Old varnish can be removed with abrasive paper, scraper or paint stripper, and then the surface should be rubbed down well with wire wool and water plus a little ammonia. Rinse well and allow to dry. Use a proprietary wood restorer if necessary to return wood to its original colour. Then revarnish, carefully following directions on the can. A large jagged crack down the outside of a building indicates a serious fault, usually in the foundations of the house, and it is important to consult a surveyor or experienced builder as to its cause quickly. Mouldy patches on walls indicate a damp problem of some kind. Find and cure the cause of damp, then wash down the whole area with a solution of one part ordinary domestic bleach to four parts water. Repeat a day later, then leave to dry for two days. Rinse off with clear water. Gaps between frameworks and walls should be filled; if left they will allow the passage of damp. Use a non-hardening mastic available from your builders’ merchant. This type of filler allows for the contraction and expansion of the wooden frames. If you have a lot of repairs to make you can use an applicator ‘gun’, which can be bought or hired. Very large gaps can be plugged first with rolled up rags, rope or fine mesh wire then finished off with mastic. Renew all cracked sections of putty on window frames. Timber sills must be protected with paint or varnish, but these coatings should only be applied to sound, clean, dry wood. Scrape or plane away any defective areas and use exterior grade filler for small cracks or holes; allow to dry thoroughly, then sand smooth and use a knotting compound to seal resinous knots before painting. Large areas of rotten wood must be cut away to leave a wedge-shaped cavity. Cut a piece of new wood to match the gap and use a waterproof glue and rustless nails to fix this in place, then prime before painting. Concrete is made from Portland cement, mixed with sand and/or stone particles , plus water. Mortar is a mix of cement, sand and water without any larger stone particles. Cement is usually grey, but white cement can be used for coloured mixes or for a light coloured mortar required for pointing. Bags of pre-packed dry mixes for concrete and mortar, with suitable proportions of cement and aggregate for most small jobs around the house and garden, are stocked by builders’ merchants and D.I.Y. shops. These are probably easiest for the amateur. Use a bucket for measuring quantities or ‘parts’, and a clean dry shovel or spade for turning the mix. First measure out the sand and coarse aggregate and tip into a heap. Measure the cement powder, tapping the bucket to compact the powder, then tip this on to the top of the heap. Use the shovel to turn the heap, always from the bottom, until the mixture is a uniform colour throughout. Even pre-mixed materials will need mixing in this way, as they tend to separate out in the bags while being stored. Make a crater in the top of the heap and very gradually add tap water, preferably from a watering can, and just sufficient to make the concrete stand up in a stiff pile. Continue to turn the heap until the mix is even; add more water if need be. Never try to dispose of leftover cement mix by sluicing it down a drain; it will cause a major blockage. A ‘drip groove’ runs underneath sills parallel with the front edge to keep water clear of the wall underneath; check that all drip grooves are unobstructed and not blocked, for example, by dirt or paint. On concrete sills, you can use an exterior grade filler for small cracks or holes. However, if the sill has crumbled away, you will need to build it up again with a concrete mix of one part cement to two parts fine sharp sand. Chip the crumbling sill away to a sound surface using a cold chisel and a wooden club hammer, and carefully brush away all debris and loose dust. Then give the surface a coating of cement grout: cement and water mixed to a thick creamy consistency. This improves the bonding of concrete. Use a trowel to apply the concrete mix; a straight plank of wood is helpful for shaping right-angled edges. If necessary, you can fix a wooden framework around the sill as a support for the new concrete. Smooth off the repair with a steel float using a circular motion. Protect the repair from ram, hot sun or frost by covering it with damp sacking or polythene and do not use until concrete has completely hardened. The same techniques can be used for repairing door sills and door steps. When cracks appear in concrete it is best to leave them for a few months to settle. When they do not seem to be getting any worse, you can carry out repairs as follows. When dealing with very fine hair-line cracks, first brush the path well to remove surface dust. Then make a cement grout: cement and water mixed to a creamy consistency. Pour this over the surface of the path and allow it to settle and harden. Larger cracks can be repaired with a concrete mixture of one part cement to two parts sand. Use a bolster chisel and club hammer to chip out the crack until it is wider at the back than at the front. Brush out all loose debris and dust. Then apply a coat of cement and water, mixed to a creamy consistency, to improve the bond of concrete to concrete. While this is still wet, trowel on the concrete mix, and smooth off with a steel float. Repair broken edges with a concrete mixture of one part cement to three parts all-in aggregate. If necessary, support with a board held firm with timber stakes while the concrete dries. Larger defective areas , or depressions, should first be chipped away to make a neat square or rectangle, with a uniform depth of about I cm. Remove all loose particles and brush out well. Then wash out thoroughly with clear water, and apply to the moist surface a creamy consistency mix of cement and water, to improve the bond of concrete to concrete. Apply generously a concrete mix made from one part cement to two parts sharp sand. At first let the mix stand about I cm above the surrounding surface, so that you can ‘tamp’ it well down with a stout wooden board used on edge. Use the wooden board to level off the surface. If necessary, use a brush to texture the surface-to match the surrounding concrete. Cover the repair with a piece of damp sacking, or a piece of polythene. While the surface is still very wet, hold the covering away from it with, for example, blocks of wood. Keep the repair covered for two or three days. ESS and relaid. But if the stone is cracked or if it cannot easily be removed intact, break it up with a club hammer and cold chisel working from the middle of the slab outwards. To put in a new slab, or to relay the old one, make a mortar mix of one part cement to five parts sand and, after cleaning out the hole, apply a blob in each corner and one in the middle, or a full bed of mortar. Place the slab in the hole, and tap down gently with the handle of the club hammer until flush with surrounding slabs. Check the level with a straight piece of wood. If necessary, lift out the slab again and adjust the level of the mortar mix. Finally, brush a dry mix of sand and cement into the edges and point thejoints to match the surrounding stones. Replacement bricks in brick paving should be laid on a bed of mortar made from one part cement to three parts sand. To remove the old brick, break it up from the middle outwards with a bolster chisel and a wooden club hammer. Then clean out the hole and apply a layer of mortar -’butter’ mortar around the edges of the new brick and place it in the hole. Use the handle of the trowel to tap the brick down level with the surrounding bricks. If the brick sinks too far, or it it will not go down far enough, take it out and adjust the level of the mortar bed as for paving stones. Finally, point the joints. Timber fences should be treated with wood preservative once a year, carefully following the manufacturer’s instructions. Or you can use creosote , but this will darken the wood noticeably. The timber should be dry when you apply the creosote. Inspect fences regularly as damage noticed at an early stage can usually be easily and simply repaired. But wooden fences can quickly deteriorate if left neglected, and then your only option may be a costly replacement. Gravel boards are often fitted horizontally along the bottom offences, to prevent damp from rising up and damaging the fence boards themselves. Try to keep gravel boards free from soil and plants and replace rotted boards immediately. If you dig a small trench, it is easier to fit the new board into position. New boards may be slotted into grooves in the fence posts or nailed to wooden blocks which have been screwed to the fence posts. Gravel boards should fit flush with the front of the fence. To fit new gravel boards to concrete fence-posts, first drive pegs into the ground so 156 that at least 30 cm of each peg is below the ground. Then nail the new gravel boards to these pegs. Fence posts can be prevented from rotting by digging away the soil around the base of the post occasionally, and applying a couple of coats of wood preservative or creosote. Sound fence posts sometimes work loose. Dig away the soil round the bottom of the post and pack out the hole with, for example, bricks and gravel, then top off with well-rammed soil. However, if the fence post has begun to rot away, you can strengthen it at the bottom by bolting on a concrete spur which you can buy at a builders’ merchant or garden centre. The spur should be set in the ground to a depth of about 75 cm and should be fixed to about 45 cm of sound post with galvanized bolts. Make a temporary support for the fence post with a couple of timber struts. Dig away around the bottom of the post, and saw off the rotten part, leaving only sound dry timber. Soak the end grain of the post in wood preservative. Enlarge the hole sufficiently for the spur and put it in to see exactly how it will need to fit against the post. Mark the position of the spur fixing holes on to the post. Take out the spur, and drill holes in the post to receive the bolts from the spur. Now put the spur back in the hole again and pack rubble around to hold it upright ; fix the spur to the post and tighten the bolts. Then fill the hole with a dryish concrete mix made from one part of cement to five parts of all-in aggregate. Again, use your spirit level to make sure that the fence post is vertical. Sometimes, posts rot from the top downwards, in which case saw off the tops at an angle, then treat them with wood preservative. A piece of aluminium or zinc folded around the edge of the post and fixed with galvanized nails will protect the post tops more thoroughly. Alternatively, you can cut off the posts square, then fit capping pieces which have been soaked in preservative. Fix the caps with galvanized nails or screws. Sagging gates may be caused simply by screws loosening in their hinges, so try tightening these. If the screws fit so loosely in their holes that they cannot be tightened, remove the hinges and fill the holes with timber plugs before refitting hinges and screws. If the gate post is weak, strengthen it with a concrete spur as described for fences, above. There are several possible remedies for loose joints in a wooden gate. You can fit a brace diagonally across the gate, secure it with glue and screws and paint to match the rest of the gate. Or you can use galvanized metal brackets fixed to the gate with screws and painted. Or you can take the gate to pieces and reglue the joints. Use waterproof adhesive, and cramp securely until adhesive is dry. Protecting against rust is the top priority for metal gates. Once rust gets a hold, it can eat its way right through the metal. So inspect your gate regularly. Using a wire brush or emery paper, scrape away any spots of rust back to the bright metal and then clean with white spirit and prime at once with metal primer. Give metal edges a second coat of primer as they are particularly vulnerable to knocks and bangs; make sure that you brush primer well into screws, rivets and bolts, and around hinges. When dry touch up to match rest of paintwork.